We like this area for the beaches and the offshore islands. You can't beat the proximity to the beaches, the golf courses, the casinos and the nearby military bases. We like to walk the beach in the morning right at sunrise and again in the evening at sunset. 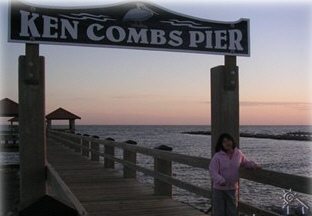 We also enjoy walking to the nearby piers and fishing in the Gulf of Mexico. A three minute walk straight out the front door puts you standing on a beautiful white sandy beach on the Gulf of Mexico. Beautiful historic Victorian home built in 1900 situated on Second Street in a very established and charming neighborhood graced by lovely plantings including camellias and numerous towering live oaks. This neighborhood affords the opportunity for great walks with your family or your dog. This home has been completely updated and features the original high ceilings and heart pine floors. A wrap around porch with wicker furniture and a double "love" swing greet newcomers as they ascend the front porch. I am a pilot, a Captain with a major airline and have traveled all over the world. In all of my travels I have found the beaches of southern Mississippi to be some of the best and the beaches of the offshore islands are simply beautiful. The southern hospitality in this town is wonderful. My daughter in the picture loves it here in Gulfport.